The Jaeger-LeCoultre Deep Sea Chronograph watch has an operating indicator for the chronograph which contributes to divers’ safety by enabling them to check at a glance that the chronograph is indeed measuring a certain time interval, that it is ready to be activated, or that the measured time is displayed on the various counters. This specific feature is inspired by a historical Jaeger-LeCoultre model: the Chronoflight. This onboard chronograph was invented in 1930 to equip civil and military aviation. It further enriched the range of onboard instruments made by Jaeger since the 1910s. The Chronoflight featured a number of subdials and totalisers, serving in particular to calculate total flight times while deducting stopovers. Used for over 30 years, its sturdiness and its precision also made it a favourite among motor-racing drivers. Today’s Jaeger-LeCoultre Deep Sea Chronograph watch is inspired by a technical device featured in the Chronoflight in order to make it available to divers. Appearing on the watch dial above the Jaeger-LeCoultre signature, a round aperture reveals the chronograph operating indicator. The latter is composed of two discs – one white and the other red – which provide the required information regarding the state of the chronograph, without any risk of error. When the display is white, the chronograph is ready to be activated in order to begin measuring a time interval. Once the chronograph has started, the indicator window simultaneously shows both colours – red and white – in order to signal that a measurement is in progress. Finally, when the chronograph has stopped, the red disc appears on its own in the window to indicate that the measurement performed may be consulted, before resetting the chronograph. 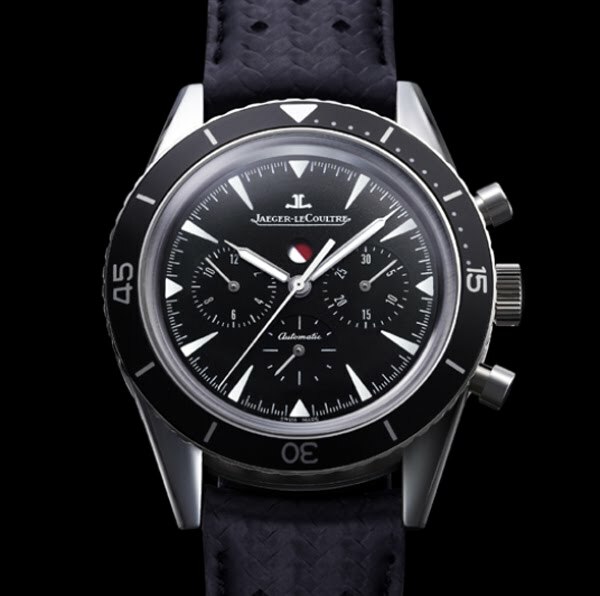 The Jaeger-LeCoultre Deep Sea Chronograph watch is an instrument designed for professionals and therefore complies with all the criteria imposed on diver’s watches by the ISO 6425 standard. It features a unidirectional rotating bezel, is water-resistant to 10 bar (100 metres), readable in the dark, and also meets the corresponding demands in terms of magnetism and resistance to shocks. The operating indicator takes the form of a small seconds subdial at 6 o’clock. This model is driven by the new automatic Jaeger-LeCoultre Calibre 758 featuring a balance oscillating at a rate of 28,800 vibrations per hour and endowed with a 65-hour power reserve. Its chronograph comprises two counters (one each for the hours and minutes) along with a central sweep seconds hand. The watch dial is distinguished by the clarity of the indications provided by the luminescent hands and hour-markers. Two push-pieces positioned at 2 and 4 o’clock on either side of the crown serve to start, stop and reset the chronograph. The 42 mm-diameter stainless steel case is fitted with a black leather strap. Thus in 2012, the Jaeger-LeCoultre Deep Sea epic continues with a model that will make its mark on its time and join its legendary predecessors thanks to the precision, reliability and inventiveness that have consistently characterised the Grande Maison in the Vallée de Joux since its creation and which, today more than ever, meet the full range of demands expressed by devotees of professional and elegant instruments.